Julie Leask is a social scientist and Associate Professor in the Sydney Nursing School and School of Public Health, University of Sydney. She is also visiting fellow at the National Centre for Immunisation Research & Surveillance and has cross appointments with the Centre for Values, Ethics and the Law in Medicine and the Marie Bashir Institute for Infectious Diseases and Biosecurity. 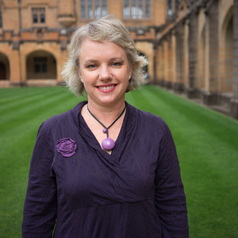 Julie has a background in nursing and midwifery with a Master of Public Health (1998) and PhD (2002) from USYD. Julie’s research looks at health risk communication and behaviour with a focus on immunisation and infectious diseases. She is currently working on a program of NHMRC and government-funded research focused on vaccination hesitancy and refusal.